Adorable 18 year old Megan was in the shelter with little chance of adoption. She is thrilled to have been rescued and tries to never leave a lap!! She has severe dental disease and a heart murmur which are both common findings in seniors. We will get her teeth cleaned and monitor her heart disease going forward. Our goal is for this little lady to be pampered and loved in her golden years. Aunt Martha is a special little case. She was turned into Ventura County shelter in May of 2016. She had a very serious cough and required medical care at the shelter. This hindered her from getting adopted into a forever family. Martha was fostered out several times but each time she was brought back to the shelter for various reasons. VCAS reached out to us in August to see if we could be that special forever place for Martha. We said yes and our vets have diagnosed severe airway/bronchial disease which requires ongoing medication. Poor Martha also developed some serious separation anxiety through all of these experiences and she is requiring some anti anxiety medication also. Marthais doing much better and will stay with us and get the care and stability she needs and we are happy to help this special little lady. 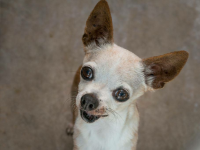 Fayleen is a 12+ year old Chihuahua/Papillon mix is very tiny and delicate. She was rescued from the Ventura County shelter. She is missing most of her lower jaw due to years of neglected teeth. She had 2 rotten infected teeth and a severely matted coat. We have fixed all of those things and found a little princess underneath who likes to be pampered!! She is truly a darling girl who has stolen our hearts!! From the moment we saw this little face wew knew we had to help this little guyl!! His name is Alfredo and he is a 4 pound toothless little 10 year old chihuahua. He is quite a little snuggler and likes to be under the covers. He gets along great with other animals and is just an adorable and happy little senior. 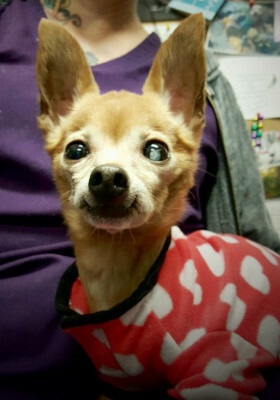 Koa is an adorable little 10 year old chihuahua . He was rescued from the Orange County shelter with very severe dental disease and fracture to his lower jaw. He is absolutely adorable and well mannered. He seems to be house trained and gets along well with other dogs. He is a quiet mellow little 5 pound guy. Meet our special girl Astrid! Astrid is a 5 year old beauty and is somewhat of a special needs girl. She is very healthy but has been abused in her past and is very fearful of men initially. It takes her a little while to realize not all men will hurt her and she does eventually warm up. She is very receptive to food and this is a great way to make friends with her. Once she is comfortable she cant love you enough!!! She is great on a leash, in the car and good with other dogs. She really wants to bond with someone and is quite loving once she knows you. She does need a patient person to work with her if there is a man in the home. But if you are willing to put in the time you will be greatly rewarded! !